The Global Change Research Act was established in 1990 requiring the government to do an assessment on global climate change every four years. The last report was issued in 2000 during the Clinton administration. Realizing the Bush administration had no intention of complying with the law, several environmental groups filed a lawsuit forcing the administration to release an assessment by the end of May – four years late and only months from the end of Bush’s watch. The White House finally released its 271–page Scientific Assessment of the Effects of Global Change on the United States last Thursday, confirming what until very recently Bush has steadfastly denied – that global warming is real. The assessment reports, in part, that human-induced global warming will likely cause increased droughts in the U.S. west and stronger hurricanes, also saying that the last 50 years has seen an increase in the number of heat waves, and hurricanes, as well as rising sea levels. 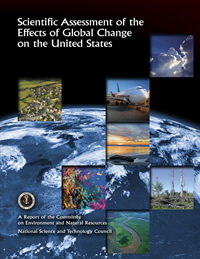 The report is an amalgam of the work done in 2007 by the IPCC and previous research from the government Climate Change Science Program, and was released just as a group of 1700 scientists, including six Nobel prize winners, issued a letter calling for the United States government to take the lead in fighting the “unprecedented and unanticipated effects” of climate change by immediately reducing carbon emissions.